Graves’s The Emperor’s New Clothes has so many things wrong with it, so many untruths, half-truths, and examples of naivety, that it is difficult to know how to begin critiquing it. Nonetheless, such must be done, so I will begin at the beginning (page 1) and continue until the end of the first section (page 52). First, Graves dances around with the definition of race. His first approximation seems reasonable, â€œThe term ‘race’ implies the existence of some nontrivial underlying hereditary features shared by a group of people and not present in other groupsâ€ (5) but his thoughts go down-hill from there. Latter in the page he notes that â€œNone of the physical features by which we have historically defined human races… unambiguously corresponds to the racial groups we have constructed.â€ First, Graves’ look for unambiguous markers is misguided. Not all human beings are born with a brain, but possession of the brain is nonetheless typical for the human race. Secondly, Graves attempts to jump between a physical definition of race and a socially constructed definition. Our concepts of race imprecisely but accurately describe real genetic populations (Parra, et al., 2003; Pimenta, et al., 2006) in spite of what graves later claims (36).. Ultimately, the definition Graves takes from the dictionary may be best: â€œA population of organisms differing from others of the same species in the frequency of hereditary traits; a subspeciesâ€ (6). Graves’ question, â€œHow much genetic difference must there be before a subspecies can be said to exist?â€ is best answered with â€œa statistically significant amount.â€ If this implies races and sub-races, and sub races within those, so be it. In some cases, it may be that it is easiest to speak about those who left Africa and those who stayed (Underhill, P.A., et al., 2000), as Africans, Asians, and Europeans (Bamshad, et al., 2003), or even smaller groups. (Lindh, Andersson, & Gusdal, 1997). Graves historicism confuses him as to the nature of those he disagrees with. Believing that genes vary in significant ways among breeding populations â€“ that races exist â€“ does not imply that â€œinequalities cannot be fundamentally altered by environmental interventions such as social programs.â€ Indeed, almost the reverse is true: if we are born with differing genetic propensities, identical environmental factors will lead to unequal environments. The conclusion then is that if we are born differently genetically, we can create unequal outcomes to lead to equal outcomes. As Stephen Pinker writes, â€œthe more equal we make society, the higher heritability will be, and the more genes will matterâ€ (Pinker, 2002, 77). Going back to Graves’ definition, he claims that the â€œJews were a cultural group rather than a biologically distinct population (to say nothing of a race)â€ (20). Again, the Jewish population appears to be an interaction between real genetic links and socially constructed ones. As Behar et al. 2003) summarize the evidence, â€œthe Cohanim, a paternally inherited Jewish priestly caste, predominantly share a recent common ancestor irrespective of the geographically defiend post-Diaspora community to which they belong, a finding consistent with common Jewish origins in the Near Eastâ€ (768). His social construction leads him to confuse anti-Judaic acts of Catholics with anti-Semitism, where he lists anti-Jewish attitudes (21) that were based on belief, not parernity. Graves also suffers from his apparent ignorance of the tools of social science. He approvingly quotes Frederick Douglass’s thoughts on â€œthe impossibility of legitimately comparing the innate abilities of different races in a society that maintained such disparity in the physical conditions in which the races lived.â€ Dougglass believing that was understandable, as John Dewer’s revolution of the social science had not happened when he wrote such words. But for the last century scientific examination of humans has relied on correlation and regression two tools that do not only require similar conditions but often spurn them (so that more variables may be examined). Social science does not work by naively comparing two groups identical in one category and different in two others, but by explaining the variance of dependent variables in terms of independent variables. Related to this is Graves’ frustratingly simplistic statements on genetics. He expects us to believe that, somehow, the fact that there â€œis more genetic variability in one tribe of East African chimpanzees than in the entire human species!â€ means anything at all. What is his point? Is he claiming a consistent cross-species relationships between â€œgenetic variabilityâ€ (however he defines it) and phenotypic and extended phenotpyic variability? Such a statement could easily be read to imply that races matter, as when fewer things change they may matter more. Ultimately, Graves is silent on the meaning of this rhetorically nifty but substantively empty statement. Bamshad, M.J., Wooding, S., Walkins, W.S., Ostler, C.T., Batzer, M.A., Jorde, L.B. (2003). Human population genetic structures and inference of group membership. American Journal of Human Genetics 72: 578-589. Behar, D.M., Thomas, M.G., Skorecki, K., Hammer, M.F., Bulygina, E., Rosengarten. D., Jones, A.L., Held K., Moses, V., Goldstein, D., Bradman, N., & Weale, M.E. (2003). American Journal of Human Genetics 73: 768-779. Graves, J. L., Jr. (2001). 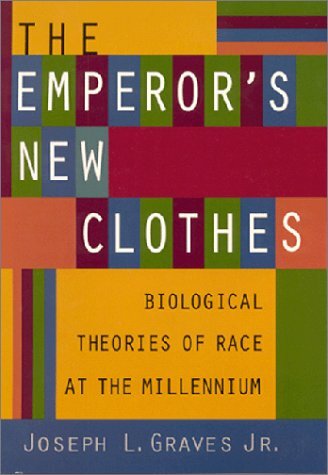 The emperorâ€™s new clothes: Biological theories of race at the millennium. New Brunswick, NJ: Rutgers University Press. Lindh, M., Andersson, A.S., & Gusdal, A. (1997). Genotypes, nt 1858 variants, and geographic origin of hepatitis B virus–large-scale analysis using a new genotyping method. Journal of Infectious Diseases 175(6): 1285-1293. Parra, F.C., Amado, R.C., Lambertucci, J.R., Rocha, J., Antunes, C.M., & Pena, S.D.J. (2003). Color and genomic ancestry in Brazilians. PNAS 100(1): 177-182..
Pimenta, J.R., Zuccherato, L.W., Debes, A.A., Maselli, L., Soares, R.P., Moura-Neto, R.S., Rocha, J., Bydlowski, S.P.k, & Pena, S.D. (2006). Color and Genomic Ancestry in Brazillians: A Study with Forensic Microsatellites. Human Heredity 62(4): 190-195. Pinker, S. (2002). The Blank Slate: The Modern Denial of Human Nature. Viking Adult: New York, NY. Underhill, P.A., Shen, P., Lin, A.A., Passarino, G., Yang, W.H., Kauffman, E., Bonne-Tamir, B., Bertranpetit, J., Francalacci, P., Ibrahim, M., Jenkins, T., Kidd, J.R., Mehdi, S.Q., Seielstad, M.T., Wells, R.S., Piazza, A., David, R.W., Feldman, M.W., Cavalli-Sforza, L.L., & Oefner, P.J. (2000). Y chromosome sequence variation and the history of human populations. Nature Genetics 26: 358-361. “New Tactic In Evolution Debate,” by G. Jeffrey MacDonald, CBS News, 3 May 2005, http://www.cbsnews.com/stories/2005/05/03/tech/main692524.shtml (from Democratic Underground). # The origins of life. Why do textbooks claim that the 1953 Miller-Urey experiment shows how life’s building blocks may have formed on Earth – when conditions on the early Earth were probably nothing like those used in the experiment, and the origin of life remains a mystery? # Darwin’s tree of life. Why don’t textbooks discuss the “Cambrian explosion,” in which all major animal groups appear together in the fossil record fully formed instead of branching from a common ancestor – thus contradicting the evolutionary tree of life? # Vertebrate embryos. Why do textbooks use drawings of similarities in vertebrate embryos as evidence for common ancestry – even though biologists have known for over a century that vertebrate embryos are not most similar in their early stages, and the drawings are faked? # The archaeopteryx. Why do textbooks portray this fossil as the missing link between dinosaurs and modern birds – even though modern birds are probably not descended from it, and its supposed ancestors do not appear until millions of years after it? # Peppered moths. Why do textbooks use pictures of peppered moths camouflaged on tree trunks as evidence for natural selection – when biologists have known since the 1980s that the moths don’t normally rest on tree trunks, and all the pictures have been staged? # Darwin’s finches. Why do textbooks claim that beak changes in Galapagos finches during a severe drought can explain the origin of species by natural selection – even though the changes were reversed after the drought ended, and no net evolution occurred? # Mutant fruit flies. Why do textbooks use fruit flies with an extra pair of wings as evidence that DNA mutations can supply raw materials for evolution – even though the extra wings have no muscles and these disabled mutants cannot survive outside the laboratory? # Human origins. Why are artists’ drawings of apelike humans used to justify materialistic claims that we are just animals and our existence is a mere accident – when fossil experts cannot even agree on who our supposed ancestors were or what they looked like? # Evolution as a fact. Why are students told that Darwin’s theory of evolution is a scientific fact – even though many of its claims are based on misrepresentations of the facts? The exception? “Evolution” (meaning the descent of man) is not a fact because it is not a datum — it is a theory because it explains facts. In the other questions the creationists are rightly attacking Darwinian propaganda. These findings confirm the experience of Gerry Wheeler, the group’s executive director, who says that about half the teachers he talks to tell him they feel ideological pressure when they teach evolution. it ultimately irrelevant. Most public secondary school science classes are trash, and nothing is lost if they are infiltrated by these zealots. (It is very hard for them to get worse.). More important is that science classes are being reclaimed from textbook-authoritarians.